The High Tech Kinshi Sieve I is a Gravity Fed pre-filter to filter waste solids from the water via a bottom drain or through a skimmer. This technique incorporates a sieve-bend. A sieve-bend consists of hundreds of sharp stainless steel profile wires with very small slot openings where the water can go through but the solids stay on the sieve bend. In practice it works as follows: The water enters the High Tech Kinshi Sieve I via the Ultraskim or bottom drain and passes through the “auto-adjustable” dam and will go upwards and fall over the weir on to the Stainless Steel sieve-bend. The water goes through the sieve bend and the waste solids will slowly go down to the waste area. At the waste outlet of the filter is a 2 inch male thread connection with end cap for attaching a 2 inch slide/Ball valve to easily wash away the waste with water. When the water in the tank underneath the sieve-bend is not pumped away fast enough the water will raise which makes the floating system (auto-adjustable dam) go up to reduce the incoming water flow. The pump will be connected to the 2 inch male thread outlet. You can use a pump like a Sequence 18000S Pump or Speck Badu Top or a submersible pump that can be used out of the pond like the Oase Aquamax Eco 16000 or Oase Aquamax Start 8500 Pump. An extra advantage of High Tech Kinshi Sieve I pre-filter is that the water will be provided with extra oxygen, when it goes through the slots. Plus the mechanical waste is removed from the water itself. Gravity fed from a bottom drain or skimmer make sure the upper edge of High Tech Kinshi Sieve I is 1 cm higher than the maximum water level, also its important to make sure the High Tech Kinshi Sieves are on an equal, level, ground. Between the bottom drain and the High Tech Kinshi Sieves or a skimmer and the High Tech Kinshi Sieves we strongly advise you to use a slide valve or ball Valve to separate the High Tech Kinshi Sieves from the pond when necessary. The inlets of the High Tech Kinshi Sieves are made of 110 mm Polypropylene pipe so you can use one of our rubber boots to join the two together. Since the High Tech Kinshi Sieves are made of Polypropylene you cannot make any glue connections. 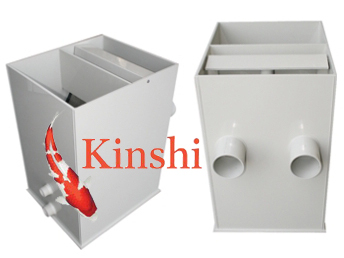 The High Tech Kinshi Sieve range have 1 inlet up to 3 inlets all 110 mm depending on which model and flow you require. The High Tech Kinshi Sieve has a floating system to prevent the water in the area under the sieve from rising above the level of the sieve for low speed pumps and also to prevent the water from going too low to be primed for high speed pumps. To remove the waste that is on the surface of the High Tech Kinshi Sieve is very easy by opening the waste outlet and to rinse the waste away with a normal hosepipe. Another method to have water run over the screen is pushing down the adjustable dam, which will flood the screen with water. When the adjustable dam is in a low position already because of the pump speed you can pull up the dam for a short while and push it back downwards again. To remove the waste that has gone into the profile wires of the High Tech Kinshi Sieve (only when necessary) you will need a hosepipe with a powerful spray nozzle or a high-pressure machine. For this way of cleaning you have to place the sieve in an upright position or take the sieve out of the unit. After a certain period of time the sieve can get “fat” and this will make it more difficult for the water to go through. You can clean the sieve with i.e. alcohol. Note: when you use the sieve for the very first time the surface of the sieve can also be covered with a very thin film. Make sure you clean the sieve very thorough with alcohol before using it. The perfect solution for pump capacities up to ±35m³/h. (35000 lph) The most ideal pre-filter! Create a compact filter system by combining the High Tech Kinshi Sieve I with a beadfilter or other pump fed filters. The High Tech Kinshi Sieve II is a Gravity Fed pre-filter to filter waste solids from the water via a bottom drain or through a skimmer. This technique incorporates a sieve-bend. A sieve-bend consists of hundreds of sharp stainless steel profile wires with very small slot openings where the water can go through but the solids stay on the sieve bend. In practice it works as follows: The water enters the High Tech Kinshi Sieve II via the Ultraskim or bottom drain and passes through the “auto-adjustable” dam and will go upwards and fall over the weir on to the Stainless Steel sieve-bend. The water goes through the sieve bend and the waste solids will slowly go down to the waste area. At the waste outlet of the filter is a 1.5 inch (50 mm) male thread with ball valve included to easily wash away the waste with water. When the water in the tank underneath the sieve-bend is not pumped away fast enough the water will raise which makes the floating system (auto-adjustable dam) go up to reduce the incoming water flow. An extra advantage of High Tech Kinshi Sieve II pre-filter is that the water will be provided with extra oxygen, when it goes through the slots. Plus the mechanical waste is removed from the water itself. 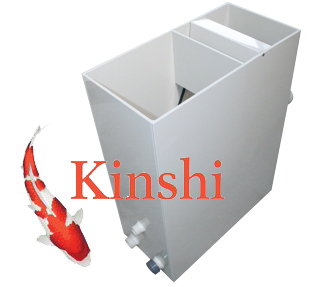 Gravity fed from a bottom drain or skimmer make sure the upper edge of High Tech Kinshi Sieve II is 1 cm higher than the maximum water level, also its important to make sure the High Tech Kinshi Sieves are on an equal, level, ground. The perfect solution for pump capacities up to ±30m³/h. (30000 lph) The most ideal pre-filter! 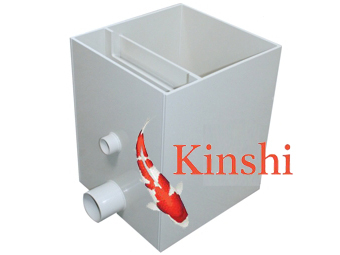 Create a compact filter system by combining the High Tech Kinshi Sieve II with a beadfilter or other pump fed filters. The High Tech Kinshi Sieve III is a Pump Fed pre-filter to filter waste solids from the water via a bottom drain or through a skimmer. This technique incorporates a sieve-bend. A sieve-bend consists of hundreds of sharp stainless steel profile wires with very small slot openings where the water can go through but the solids stay on the sieve bend. In practice it works as follows: The water enters the High Tech Kinshi Sieve III via a water pump as this model is pump fed only and passes through the “auto-adjustable” dam and will go upwards and fall over the weir on to the Stainless Steel sieve-bend. The water goes through the sieve bend and the waste solids will slowly go down to the waste area. At the waste outlet of the filter is a 2 inch male thread connection with end cap for attaching a 2 inch slide/Ball valve to easily wash away the waste with water. The pump will be connected to the 110 mm Polypropylene inlet via a Rubber Boot . An extra advantage of High Tech Kinshi Sieve III pre-filter is that the water will be provided with extra oxygen, when it goes through the slots. Plus the mechanical waste is removed from the water itself, also its important to make sure the High Tech Kinshi Sieves are on an equal, level, ground. The perfect solution for pump capacities up to ±20m³/h. (20000 lph) The most ideal pre-filter! 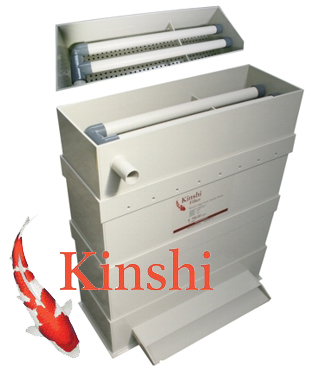 Create a compact filter system by combining the High Tech Kinshi Sieve III with other filters. Please Note: The High Tech Kinshi Sieve III is Pump Fed only and is not suitable for Gravity fed systems. The High Tech Kinshi Sieve IV is a Pump Fed pre-filter to filter waste solids from the water via a pump. This technique incorporates a sieve-bend. A sieve-bend consists of hundreds of sharp stainless steel profile wires with very small slot openings where the water can go through but the solids stay on the sieve bend. In practice it works as follows: The water enters the High Tech Kinshi Sieve IV via the Ultraskim or bottom drain and passes through the “auto-adjustable” dam and will go upwards and fall over the weir on to the Stainless Steel sieve-bend. The pump will be connected to the inlet of the sieve. You can use a pump like a Sequence 18000S Pump or Speck Badu Top or a submersible pump that can be used in the pond like the Oase Aquamax Eco 16000 or Oase Aquamax Start 8500 Pump. An extra advantage of High Tech Kinshi Sieve IV pre-filter is that the water will be provided with extra oxygen, when it goes through the slots. Plus the mechanical waste is removed from the water itself.With Gravity fed sieves from a bottom drain or skimmer make sure the upper edge of High Tech Kinshi Sieve IV is 1 cm higher than the maximum water level, also its important to make sure the High Tech Kinshi Sieves are on an equal, level, ground. The perfect solution for pump capacities up to ±20m³/h. (20000 lph) The most ideal pre-filter! Create a compact filter system by combining the High Tech Kinshi Sieve II with a beadfilter or other pump fed filters. The High Tech Kinshi Sieve V is a Gravity Fed pre-filter to filter waste solids from the water via a bottom drain or through a skimmer. This technique incorporates a sieve-bend. A sieve-bend consists of hundreds of sharp stainless steel profile wires with very small slot openings where the water can go through but the solids stay on the sieve bend. In practice it works as follows: The water enters the High Tech Kinshi Sieve V via the Ultraskim or bottom drain and passes through the “auto-adjustable” dam and will go upwards and fall over the weir on to the Stainless Steel sieve-bend. An extra advantage of High Tech Kinshi Sieve V pre-filter is that the water will be provided with extra oxygen, when it goes through the slots. Plus the mechanical waste is removed from the water itself. 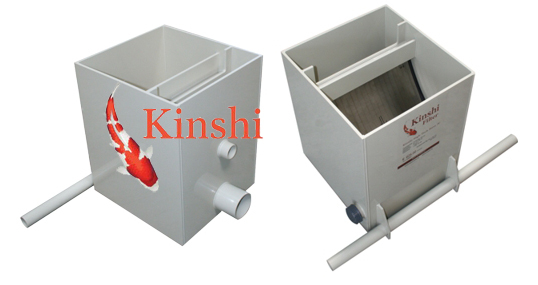 Gravity fed from a bottom drain or skimmer make sure the upper edge of High Tech Kinshi Sieve V is 1 cm higher than the maximum water level, also its important to make sure the High Tech Kinshi Sieves are on an equal, level, ground. The perfect solution for pump capacities up to ±45m³/h. (45000 lph) The most ideal pre-filter! Create a compact filter system by combining the High Tech Kinshi Sieve II with a beadfilter or other pump fed filters. 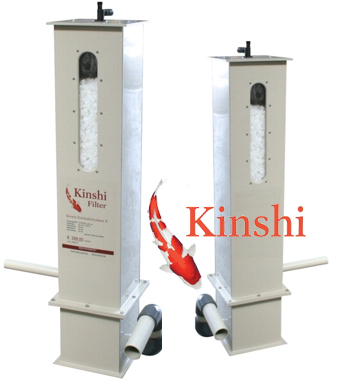 The High Tech Kinshi Trickle Tower effectively converts harmful dissolved wastes such as proteins, ammonium, nitrite, etc in the pond water into harmless compounds. The more koi swimming in a pond, the more waste. Aerobic bacteria, bacteria that occur in an oxygen-rich environment break down the waste to nitrate, a substance less harmful to water quality. To maintain optimal health for Koi good quality water is very important. In a pond with optimum water levels your koi will feel more comfortable and the growth and development of fish stimulated. The water is pumped up to the High Tech Trickle Tower filter inlet in which is then split in to two spray bars. The water then falls through the trickle units fitted with a perforated bottom where the water flows through easily. The Kinshi High Tech Trickle Tower units will be filled by the user with a filter material of choice. The Kinshi High Tech Trickle Tower also have air holes, allowing oxygen to be drawn in to the Tower units to allow optimal oxygen saturation. The Kinshi High Tech Trickle Tower bottom chamber has a full front weir leading back to the pond. This Kinshi High Tech Trickle Tower weir outlet may be adjusted as needed. At the back of the Kinshi High Tech Trickle Tower bottom chamber is a 1.5 inch (50 mm) waste outlet for draining down cleaning etc. Through the use of polypropylene as raw material the Kinshi High Tech Trickle Tower quality is guaranteed a long life. Organic waste (such as residue from food, dead leaves, etc.) that ends up in the pond consists of large chains of amino acids, also known as proteins. Kinshi Protein Skimmers separate these proteins from the pond water. The waste in the pond is broken down by enzymes and bacteria into small particles, which are small enough so that the proteins ultimately dissolve in the water. A mechanical filter can no longer remove these particles. Before these particles are broken down further into harmful substances (ammonium, nitrite, nitrate, phosphate, etc. ), and thus adversely affect the biological filter capacity, the proteins are first removed from the water by the Kinshi Protein Skimmers. Proteins accumulate on the interface between air and water. Kinshi Protein Skimmers enlarge this interface to a size that causes the many proteins to accumulate here. The water is mixed with large quantities of air in the inlet through a self-suctioning Venturi system. The water/air mixture is then distributed over a bio-wheel tower. This increases the surface area,giving the proteins more time to form better, more solid foam. On the bottom, the water runs through a sieve plate into a chamber. Under the water surface, the purified water is carried away and the foam is concentrated on top to form a specially developed pyramid, where it is then removed from the system. This is what makes the Kinshi Protein Skimmers extremely suitable for supporting biological filters in Koi ponds. In addition to proteins, the quantity of other materials such as colourants is also reduced. Absolute Koi are specialists in Koi Pond Filtration which are without doubt the most important part about any successful Koi Pond Installation, doing the job right in the first instance can save Frustration, disappointment, Hard Work and of course money !